Guys, I had the best steak ever. And I need to share. Having dinner with my bf and his mom is always a treat in and of itself. While she’s in NYC on business it’s always nice to catch up! But having dinner at Quality Italian- with the two of them on Memorial Day- was even more fantastic because it was such a lovely experience and the food was just fantastic! The restaurant itself is very trendy, modern and classy. Moreover, I always love restaurants that have big, bright windows and Quality Italian has two walls of them! I rarely dine at steakhouses and this one did not disappoint. For appetizers we split the homemade ricotta cheese. I was a bit skeptical. But man. It was so good- reminded me of the honey and butter toast I used to make for breakfast in grade school! The creamy silky smooth cheese was spread on a cutting board, drizzled with honey and pine nuts. 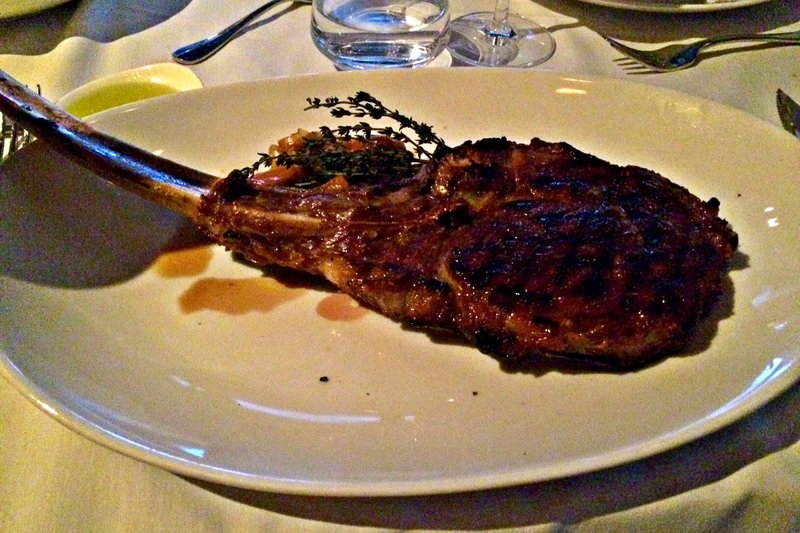 My main course- my Tomahawk Ribsteak- was literally perfect! Meaty, fatty, tender perfection. And they made a fancy, delicious steak sauce table side! I’m a huge fan of meal preparation table side… I like seeing how things are made. Then I like to act like I could do it myself… yeah right. We also split the Artichoke Maccheroni side dish, which was basically mac and cheese, on steroids. Cheesy, gooey and creamy on the inside, crunchy on top and mixed in were solid bites of artichoke hearts. Ridiculous. 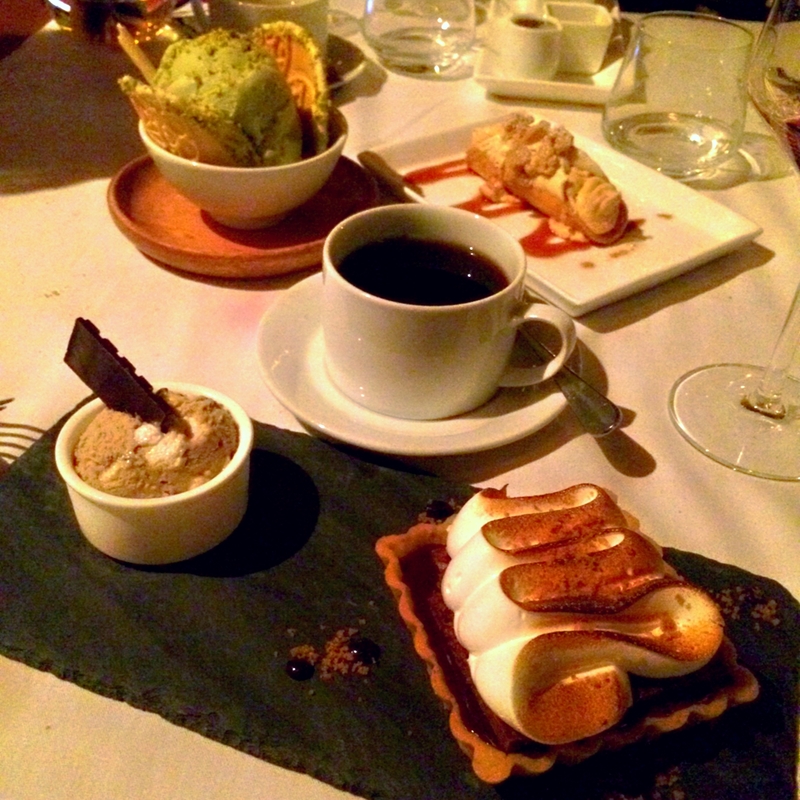 For dessert, we split three beautifully prepared sweet creations! I got The Hazelnut S’more with Burnt Marshmellow Gelato. It was a cross between a super fancy version of the s’more mixed with a rich, dense chocolate tart. <3 My bf opted for a classic- the tableside prepared cannoli! I def got excited when the Cannoli Cart rolled through- he ordered a cookies and cream one and they gave us an apple pie cannoli on the house. Creamy, crunchy and rich deliciousness! His mom got the Roasted Pistachio Gelato with Olive Oil Cake and Pizelles. Of which I also indulged. It was all sooo good. I was stuffed… but obviously, I wasn’t about to punk out on dessert. That’s like against all of my being. Although I couldn’t devour all of my food, rest assured, none went to waste! CANNOLI CART? As an Italian, I approve of this restaurant. If I ever go to New York I need to find this restaurant and eat all my meals there. YESSS!!! Yes, I approve of this decision. I could join you and eat there for every meal as well haha we could grow huge and get broke together! Cannoli Cart is my new favourite thing in life. I can’t stop staring at the food pictures. And that sounds great! I’ll give you a two day notice before I show up so we can both fast, and then eat everything…multiple times. Oh me too! I don’t joke about anything involving food haha. The second I know I’m going to New York (whenever in my life that is), you’ll be the first to know! Then we can spend all our money. Sounds amazing! I WILL BE READY!!!! Eat like a girl who likes to eat like a champion. That post made me hungry. I’m so glad I introduced you to great steaks, Chey! 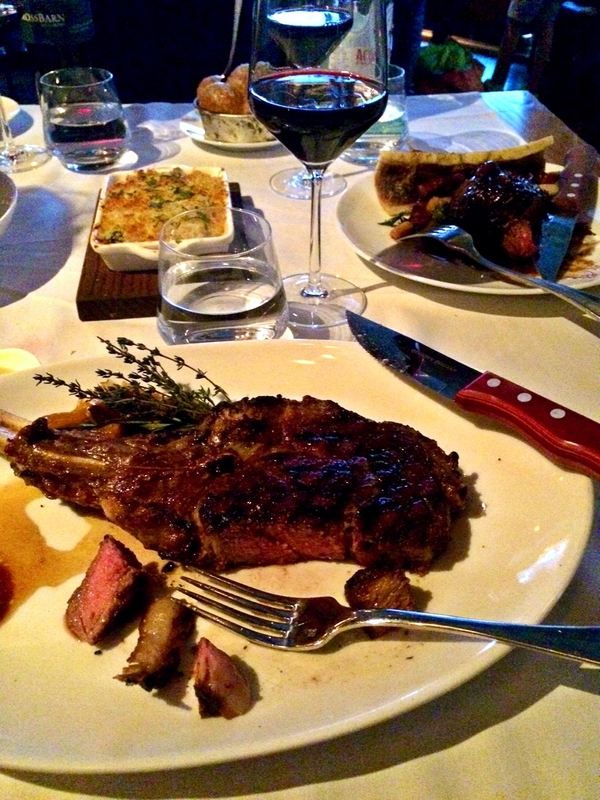 OMG…I think I need to go back to NYC just for this steak. I’ll definitely tell my cousin, who lives there, about this place. On another note, thanks for sharing and I really love your style of writing! Keep it up! Hey! Thanks so much! This place is definitely one to go to if you’re looking for ridiculous steaks.